Go forward in time to July 2006. Don't forget to add your GUADEC pictures to the Flickr GUADEC2006 pool! Last night, Fluendo held a party for the GUADEC attendees in the Vilanova beach. It was really funny and after a couple of hours and a lot of drinks, some of the Spanish guys and other brave ones ended up swimming naked in the warm Mediterranean waters of Vilanova. Also, somebody had the great idea of start swapping attendees badges. After less than 30 minutes nobody knew who had his badge, what ended up in a big confusion and disorder. Today, there is still people asking everywhere for their badges. Things that can only happen at GUADEC. I am since yesterday in Vilanova i la Geltrú, for GUADEC 2006. I arranged with Thomas from GNOME Deutschland, and we met in the Schönefeld Airport in Berlin and flew together to Barcelona. In Barcelona, we met Josh and Lucas. Fortunately, Thomas rented a car so we made the 40 kms. trip from Barcelona to Vilanova very quickly. We are lucky. Yesterday I finally met the Chileans GNOMErs. It is great to see them again after almost a year. So far things are great. 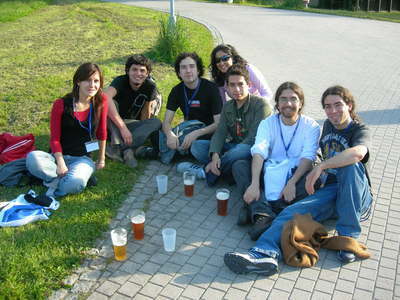 Rodrigo, Germán, and I directed the Tutorials of the GUADEC-es today. We didn't cover all the topics we wanted, but definitively it was too much for just one day. What we did was more than enough. Hopefully, we will get more people interested in learning to program in GNOME. No pictures so far, as I forgot my camera in the Bungalow where I am staying. Yesterday, I bought the tickets that will connect me on Friday with the Berlin Schönefeld Airport. I have tickets from Berlin to Barcelona that will allow me to participate in GUADEC 2006, the GNOME Conference, that will take place in the beautiful Vilanova i La Geltrú. This is possible thanks to the sponsorship of the GUADEC committee, many thanks to you guys! As a way to give back to the conference, I proposed a basic GTK+ tutorial for the GUADEC-es, the Spanish GUADEC conference that will take place during the Warm Up Weekend (24th-25th). The tutorial will be on Saturday, the 24th, in the Sala de Juntes starting at 12:15. I am very excited about it and the conference overall. I haven't used my laptop yet with an external VGA display. I have no monitors available here. This could mean, that the talk on Saturday could get spoiled if I don't know how to switch to the VGA display at a decent resolution. Any advice with this will be really appreciated. The laptop is a Compaq nx6110 with a Intel i810 graphics adapter, and Debian. After the conference, a extreme challenging month will begin. I have to write several exams including a big German certification exam, at the most TOEFL style. I have worked a lot for it but I still don't feel confident with the hard grammar (Indirekte Rede, erweitertes Attribut, und andere ähnliche Themen), but there is still some time left. Also, the Logik exam will be very challenging, specially because I had relaxed a little with the lecture, in order to give priority to German and Syntax-Directed Semantics, a lecture which proved to be more difficult than what I initially thought. Something I was really missing in EOG was a drag and drop ability, that could allow me to simply drag an image from the collection pane to a gaim conversation window and send it to my friends. So, today I took the freedom and added drag support to the eog-ng branch. 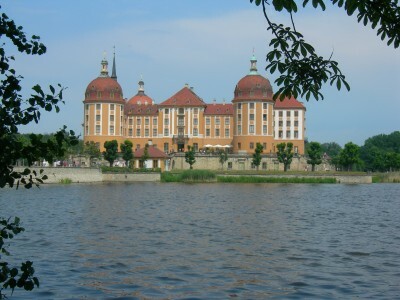 Went with the guys to the Schloss Moritzburg (Moritzburg Castle), close to the small town Coswig. The day was damn hot, but we enjoyed the morning and made some good pictures. Today I wanted to update the version of NdisWrapper. This implies compiling a kernel module, that, as you kernel lovers may already know, must be compiled using the same GCC version than the one used to compile the kernel. And then compile the module again. There is something wrong, if you are attending a first order logic lecture and at the same time are attending a lecture that uses results from second order logic. Went to Bayreuth for the weekend. We had a scholars meeting held by DAAD and the Universität Bayreuth. 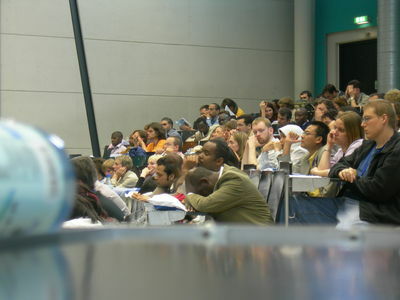 Around 500 scholars from all over the world that are studying in the southeast German states attended with their wives and children. It was great to share with so many different people. Of course, some guys were very tired in the opening talks. We watched on Friday the opening game of the Football World Cup. Obviously, the organization of the congress included in the program the possibility to watch the game in a special auditorium for the scholars, but the guys and I got bored there easily. So we went out looking for another place to watch the match, and we found a a big auditorium crowded of Germans, drinking beer, and going insane yellowing their cheers. Wir fahren nach Berlin! Wir fahren nach Berlin!, even when that was just one of several boring cheers, the environment there was full of adrenaline and it was just like being in the stadium. It was such an experience. 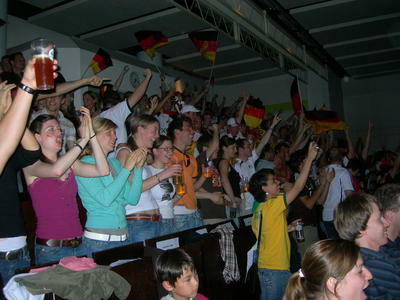 If there is something in this planet that unifies Germans, is Football. I never saw before so many schwarz-rot-golden flags. Of course, we didn't celebrate Costa Rica goals. We met nice people, including a Chilean couple that is currently studying in Leipzig, a Chilean studying Brewing (i.e., how to make Beer) in Munich, and a German girl that is going to Santiago in August thanks to an exchange program. Chile rules more than we Chileans know. The city is small and lovely. Being a University city, there are not many people living there. There are green parks everywhere, and the architecture is typical German from before the war. Like Dresden, Bayreuth was heavily bombed during the World War II, but only one third of the city was destroyed. 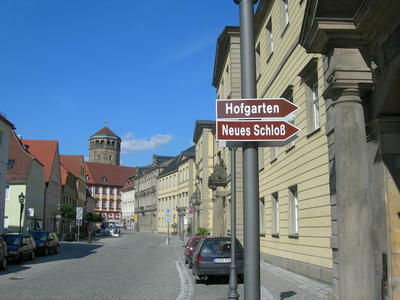 However, being after the war under the control of the allies, the reconstruction was more accurate in the whole sense and instead of the big ugly communist blocks that soviets constructed in Dresden, Bayreuth recovered its lovely houses and beautiful streets. 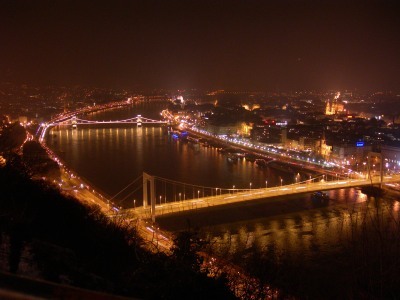 Last March I went to Budapest to visit my girlfriend. I said that I would write about the travel, but I never did. Today I felt a little melancholic, so I decided to post a little about it. Hungary, during the WWII was one of the victims of the Nazism. Being occupied by the Nazi Germany, the Hungarian government and a fascist party participated directly in the prosecution of hundred of thousands of Jews. Most of them were deported to Auschwitz and killed. The fascist party, called Arrow Cross had his headquarters in a building in Andrássy ut., which was used as a torture and murder center during the Nazi years. Shortly after the Soviets occupied Hungary and the Nazi Germany was defeated, a Communist regime began in Hungary. A kind of political police occupied then the building in the Andrássy ut., which was used, once again, as headquarters against freedom and life. Once again, thousands of people died there. Many people died in that building during both regimes, and it was only the top of an iceberg of murders and tortures around the country. Today, this building hosts a very special museum. 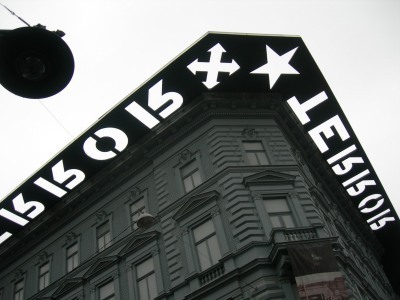 Terror Háza (House of Terror) is one of those places that you don't know if you want to recommend to visit. A visit to the basement, where people was jailed, tortured, and killed, it is certainly frightening. Even for someone who is not very close with the European history. Nóra was heavily reluctant to visit the Háza. In my first visit, in January, we tried to get in, but it was being repaired. This time, we made it. After we left it, I understood her. I think, that once we stepped out of it, we never talked again about the place. During these days, took place in the beautiful Hősök Tere (Heroes' Square) a demonstration against the Iraq War and pro Peace (I think March 18th is an International Day for Peace). 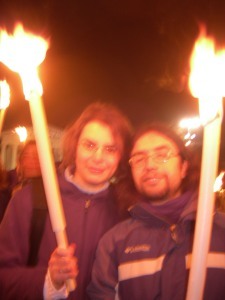 It consisted in a big mass of people holding candles and forming a big peace sign in the whole place. I think there were something like 3.000 people there. Amazing. We went there, and froze our asses for several hours. It was a nice experience, in spite of the cold weather. Of course, I don't have a picture of the peace sign, but there are some here. I think this is a good sample. And also, we made a lot of pictures. From the Gellért Hegy, this is one of my favorites. I call it, The Bridges. One ticket to Budapest. Please. 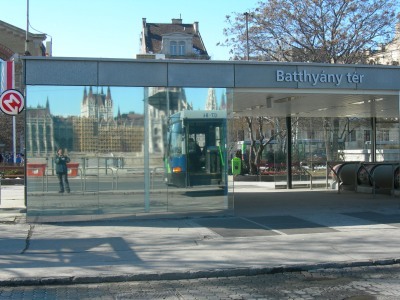 Fortunately, most of the drivers understood "Budapest" and my finger in the air (and the fact that I was alone) was enough for them to just sell me one ticket. I wish I could understand why I had to apply the patch on this thread to compile avahi, but my languages knowledge is limited to some of those using the Latin alphabet. In related news, the other day talking with a Russian-German friend, she told me that when she was very little, she was convinced that each language had its own alphabet. The reason? as she could speak both Russian and German, and was used to switch between the Cyrillic and Latin alphabets to read them, it was natural for she to think that way. Only when she got a letter that looked like German and she couldn't understand it, she realized she was wrong. The letter was in English. I am getting obsessed with languages. I know. Today commits will look frightening. I have to commit something. Trying to build gnome-system-tools in Debian can be a little problematic, because system-tools-backends depends on Net::DBus, a Perl module which isn't available in Debian. Trying to simply download and install the module in your home built GNOME prefix won't help if you don't install Perl and all its modules there, which, of course, it is not all the work that we want to do. Solution: grab the latest Net::DBus tarball, follow the Debian's administrator guide to build Debian packages of Perl modules, and use apt locally to install the freshly generated Debian package. Done my good turn of the day, I can go back to learn. Update: Or, as pointed out by Carlos, just use the --with-net-dbus=path compile time parameter. "There are kids who cannot go to school because they lack the 240 pesos (US $0.45) needed every day for the bus," said Maria Jose Sanhueza, one of the top leaders of the movement. "We will not drop this demand." The percentage of students that can't afford daily the CHP$ 240, is really lower than the percentage of students that spend daily more than CHP$ 240 in cigarettes. If they are so worried for those poor kids, it is a good moment to quit smoking, and to stop whining. Spite of that, the education in Chile is in real need of changes. But let's be honest, those changes are not related to the ticket prices or the PSU (the university admission exam) cost. Go backwards in time to May 2006.